Reiki is a hands on healing technique. It is the easiest way to heal yourself and others. By attuning to the Reiki energy, you become a conduit for the vital life force in the Universe. At the Institute of Awesome, we offer the path to Reiki Master over the course of three months. 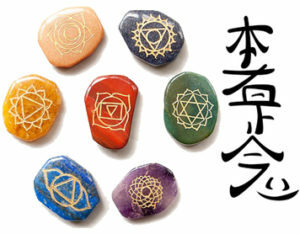 In each Reiki level, sacred symbols are sealed into your aura. Over the three workshops, your energy channels are opened 30%, 60% and then finally 100% to Reiki energy. After each attunement, the symbols you acquire will spend three days in each of your chakras, fully healing and aligning your Body, Mind and Spirit. In addition to becoming aligned with the vital life force of the Universe, you will also learn practical healing and diagnostic techniques. You will discover the power of rocks and crystals, learn energetic anatomy, fine tune your ability to sense energy imbalance, and connect with the wisdom of Ascended Reiki Masters. If you would like to be on our mailing list for updates on our next Reiki series, please Contact Us. Lunch, refreshments, and all materials are included in the price of the class. Learn how to use the healing power of the Universe to revitalize yourself. This form of healing is exceptionally safe and allows the healer to focus on healing themselves first, in order to better heal others. You will also be taught various energy systems of the body including the aura body and the chakras. Reiki I attunement will give you the first secret symbols and access to the power of Reiki. In this class, we learn the advanced Reiki symbols that heal emotional pain and transcend time and space. You will learn methods for healing those close to you, such as family members and pets. Tools for diagnosing energy blockages and illness will be given to you. Reiki II attunement will give you more access to the Reiki flow. Become a Reiki Master completely open and attuned to the Reiki energy. Acquire the Master symbols that heal past life trauma and spiritual illness. Learn how to connect and converse with the ascended Reiki Masters to receive ancient wisdom. Reiki Mastery will magnify your spiritual energy, attract positive energy your way, and make it possible for you to heal others.